It’s unfortunate that costly prescription drugs have become the new normal. How else to explain an AARP sponsored survey that finds most seniors don’t question physicians about pricey prescriptions. 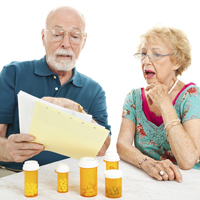 At the same time more than a quarter of seniors polled consider the cost of their prescription drugs a financial burden. The national poll involved 2,131 participants between the ages of 50 and 80 and a majority of those surveyed are taking two or more prescription drugs. Interview with Michael Jackson, Executive VP Florida Pharmacists Association.